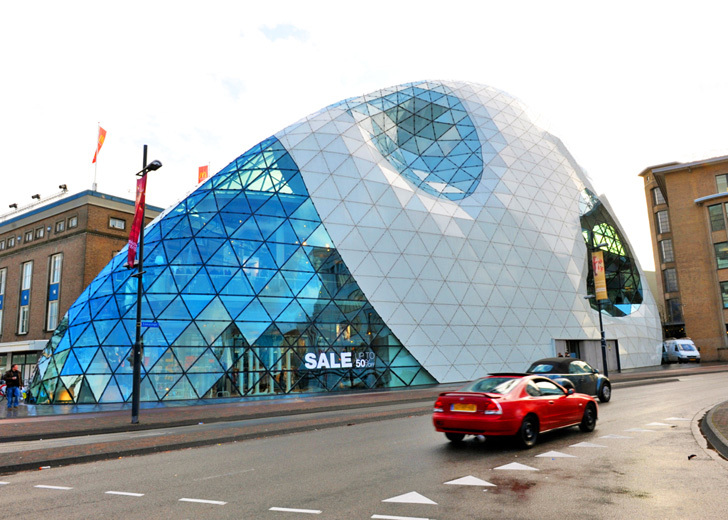 Standing among Eindhoven's old city center is a futuristic building that stands out from its surrounding environment. Named "The Blob" it was designed by Italian architect Massimiliano Fuksas and is located on the city's "18 Septemberplein" central square. The organic glass and concrete building serves as the entrance to The Admirant -- a major commercial center -- and it has become a natural meeting point in the Dutch city, which is famous for its outstanding mix of technology, design and culture. 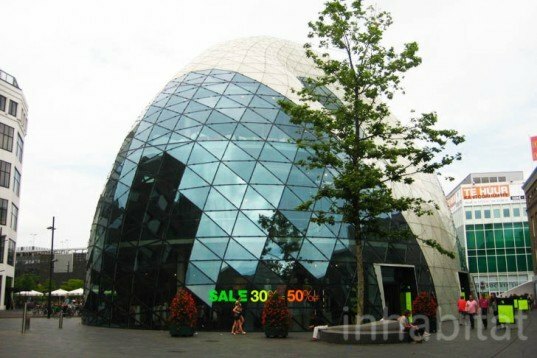 The Blob’s iconic aesthetics and spacious 10,000-square-foot interior have made it a local landmark and a popular meeting and reference point within the city of Eindhoven. The 5-story concrete structure is wrapped in a freestanding glass and steel skin that provides the building with plenty of natural light. The organic skin serves as a façade and a roof at the same time, creating a daring piece of modern architecture that connects Philips with The Admirant. Made from faceted triangular pieces of interlocking glass and steel, The Blob needs very little artificial light. Also located in the square are two smaller shelters that are similar in style and serve as the entrance to an underground bike parking lot with space for over 1,700 bikes! Love it or hate it, The Blob is an outstanding piece of modern architecture, which has found its place in the modern, innovative and experimental city of Eindhoven. The Blob's iconic aesthetics and its whopping 10,000 square foot has become a meeting and reference point within Eindhoven's city landmark. Its 5-storey concrete structure is wrapped in a freestanding glass and steel skin that provides the building with plenty of natural light. The organic skin serves as a façade and roof at the same time, creating a daring piece of modern architecture that connects Philips with The Admirant -- or the old and the contemporary city center --. Made from faceted, triangular pieces of interlocking glass and steel, The Blob needs very little artificial light. Also located in the square are two smaller shelters, similar in style and serving as the entrance to an underground bike parking with space for over 1,700 bikes! Love it or hate it, The Blob is an outstanding piece of modern architecture, which fits well in a modern, innovative and experimental city like Eindhoven.